ELIMINEX is a EPA Certified and Fully Insured 19 – Year Family Run Pest Management Operation out of South River New Jersey and has a 2nd Branch in Sayreville New Jersey that just opened up in 2010 run by Certified Master Technician Derek Benson with over 20 years Pest Management experience in Commercial and Residential insect, rodent, and wildlife control. Eliminex has several experienced certified techs on hand to service your pest management needs. Our Fall and Winter Specials showcase our Specialized offers such as Squirrel, Bat, Rodent and Nuisance wildlife trapping and removal from attics and crawlspaces which Eliminex is Wildlife Control Certified and also Termite Damage Repairs. We also offer Bio-Hazard Clean up of Garages, Attics, Basements, and Crawlspaces to kill virus and rodent-borne disease pathogen agents that exist from years of accumulated waste from rodents and wildlife which includes vacuuming, sanitizing, and replacing insulation. Free Inspections are provided for every type of service including Bed Bugs, Termites, Squirrels, Rodents, Cockroaches, Ants, etc. Eliminex Offers a 1-time service good for 30 days for homeowners on a budget all the way up to a 1 -year guarantee using the most efficient and economical approach to a solution. We don’t charge for wasted time on a learning curve because we know all the shortcuts towards fast results for every service we offer and can 100% guarantee your satisfaction. Real Estate Certification Inspections are a popular service offer because Eliminex can also evaluate visible termite damage and offer or refer a repair solution. Agreements for specific pest problems all come with a written guarantee. Many recent references and testimonials are available upon request including bed bug preparation sheet and Consumer Information Product Usage Sheet can also be faxed, emailed, or presented at the time of service or inspection. Eliminex can easily be found on your local Google Maps Section searches for many needed specialty services such as Squirrels, Bed Bugs, Mice, Rats and Rodent Control, Bees, Wasps, Carpenter Bees, Yellow Jackets, Ants, Carpenter Ants, Subterranean Termites, Ticks, Fleas, Spiders, Centipedes, Silverfish. Eliminex has over 1000 successful bed bug treatments all over Central New Jersey which the majority of bed bug problems have been eradicated within 2 treatments. Eliminex offers an optional extended 6 – month guarantee for bed bug services at a substantial discounted rate. We charge for what we feel gets the job done right and found out our prices are remarkably lower than comparable competitor treatment price offers. 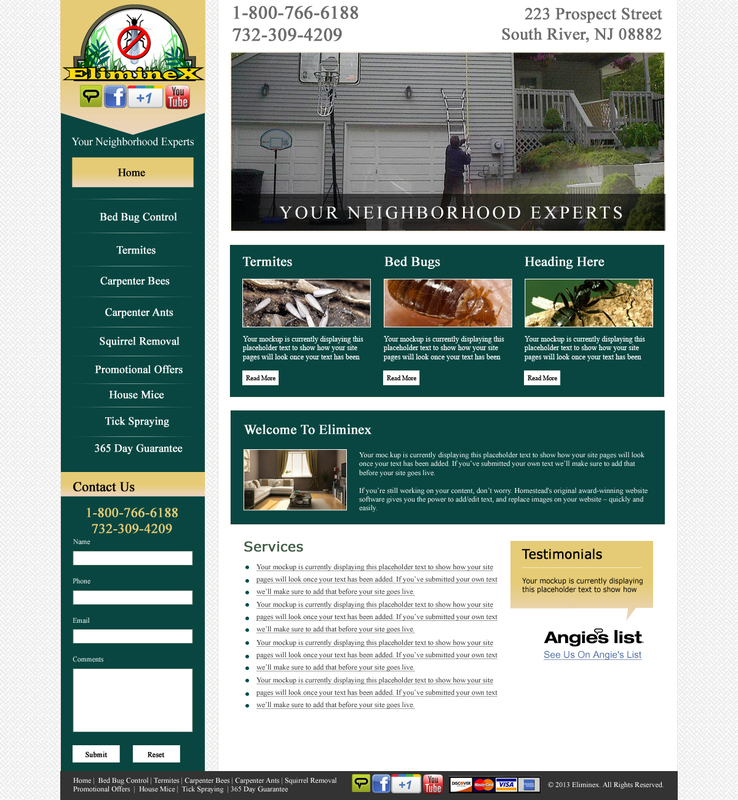 Check our website out at http://www.newjerseypest.com to see our clients reviews and current service offers Pest Control Edison NJ, Pest Control Highland Park NJ, Pest Control East Brunswick NJ, Pest Control New Brunswick NJ, Pest Control Old Bridge NJ, Pest Control Plainsboro NJ, Pest Control Perth Amboy NJ, Pest Control Metuchen NJ, Pest Control Cranford NJ, Pest Control Westfield NJ, Pest Control Summit NJ, Pest Control Elizabeth NJ, Pest Control Rahway NJ, Pest Control Union NJ, Pest Control Clark NJ, Pest Control Scotch Plains NJ, Pest Control Springfield NJ, Pest Control Mountainside NJ, Pest Control Roselle Park NJ, Pest Control Middletown NJ, Pest Control Red Bank NJ, Pest Control Hazlet NJ Pest Control Bedminster NJ, Pest Control Bridgewater NJ, Pest Control Bernardsville NJ, Pest Control Franklin NJ, Pest Control Green Brook NJ, Pest Control Hillsborough NJ, Pest Control Watchung NJ, Pest Control Matawan, Pest Control Warren NJ, Pest Control Somerville NJ, Pest Control Morristown NJ, Pest Control South Brunswick NJ, Pest Control Kendall Park NJ, Pest Control Dayton NJ, Pest Control South Plainfield NJ, Pest Control Howell NJ, Pest Control Chatham NJ, Pest Control Linden NJ, Pest Control Madison NJ, Pest Control East Windsor NJ, Pest Control Morris Plains NJ, Pest Control Randolph NJ, Pest Control Hanover Township NJ, Pest Control Branchburg NJ, Pest Control Bound Brook NJ, Pest Control Livingston NJ, Pest Control North Brunswick NJ, Pest Contol East Windsor NJ, Pest Control Keyport NJ, Pest Control Hightstown NJ, Pest Control Keansburg NJ, Pest Control Bloomfield NJ. NJ Exterminator Pest Control Servicing Aberdeen NJ, Pest Control Asbury Park NJ, Pest Control Allentown NJ, Pest Control Atlantic Highlands NJ, Pest Control Avon NJ, Pest Control Bradley Beach NJ, Pest Control Brielle NJ, Pest Control Colts Neck NJ, Pest Control Deal NJ, Pest Control Eatontown NJ, Pest Control Englishtown NJ, Pest Control Fair Haven NJ, Pest Control Freehold NJ, Pest Control Farmingdale NJ, Pest Control Freehold Borough NJ, Pest Control Freehold Township, Pest Control Hazlet NJ, Pest Control Holmdel NJ, Pest Control Howell NJ, Pest Control Little Silver NJ, Pest Control Long Branch NJ, Pest Control Iselin NJ, Pest Control Manasquan NJ, Pest Control Matawan NJ, Pest Control Marlboro NJ, Pest Control Millstone NJ, Pest Control Monmouth Beach NJ, Pest Control Neptune NJ, Pest Control Ocean NJ, Pest Control Oceanport NJ, Pest Control Manalapan NJ, Pest Control Rumson NJ, Pest Control Monroe NJ, Pest Control Shrewsbury NJ, Pest Control Middletown NJ, Pest Control Spring Lake NJ, Pest Control Spring Lake Heights NJ, Pest Control Tinton Falls NJ, Pest Control Union Beach NJ, Pest Control Wall NJ, Pest Control West Long Branch NJ. This entry was posted in about ELIMINEX of New Jersey, Pest Control Middlesex County, Pest Control Somerset County, Termites, Treatment Stories and tagged 1 year warranty pest control nj 732-698-8387, exterminating nj 732-309-4209. Bookmark the permalink.